(Doriat, 1924) Historical lactiflora. Spectacular ruby-red double blooms. Blooms midseason to late midseason on long straight stems. Globular crimson flower with frilled petals in the center. Straight stems and nice cut flower. (Vories 1929) Historical. Japanese lactiflora; soft medium pink petals. Large and rounded soft pink guard petals suffused pink and tipped and edged in yellow; carpels tipped pink, an altogether appealing bloom. Undoubtedly, one of the finest Japanese type blooms. Gorgeous in a row. (Rosenfeld, 1908) Historical double lactiflora. Deep crimson double with flowers up to 6 inches wide. Reliable as a cut flower and a garden flower. Easily recognized with its large flowers with notched petal tips. Considered by many as one of the best red double peonies. (Bigger 1940) Double lactiflora; mid-season, fragrant, 36" tall. Rose-type flowers of watermelon-red on strong dark green stems. Medium height, good grower. A very showy flower. APS Gold Medal winner, 1957. (Wild Bros, 1930) Lactiflora. Late midseason. Tall. Very large, delicate flesh color fading to pure white. Compact rose type. Stands up well and is a free bloomer with a somewhat flat face. 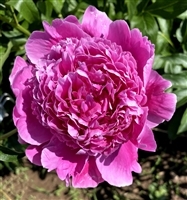 The size of the flower increases with the age of the plant, becoming one of the largest and most double of all peonies. (Crousse, 1888) An heirloom lactiflora peony known for its extensive usage in the cut flower industry. This pink bomb is very fragrant with it's full double blooms. A classic since 1888, its flowers flow freely. May need some support, but beautiful in a cottage garden. (Van der Valk/Van der Zwet, Netherland, 1953) Lactiflora. An old-fashioned classic loved for its rounded flowers and beautiful bloom. It has a small dash of red in the center. This midseason lactiflora has semi-double white blooms with fragrant flowers and strong stems, The outer petals open blush pink and fade to white rather quickly. Excellent cut flower. (Franklin, 1931) Lactiflora. Light pink double, late, tall plant. Beautiful blooms	which open well and keep well. Long stems with healthy foliage - all the attributes of an smaller cut	flower with excellent form, or a tall variety for the back of the perennial border. Like a carnation! (Klehm, 1995) Semi-double lactiflora. Early bloomer. 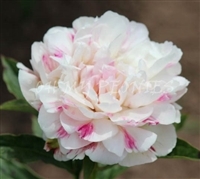 Soft delicate pink with ivory/cream inner glow at center of blossom and lower petals. Some raspberry streaking especially on outer edge of guard petals. Light speckling, almost delicate picotee effect. 4 1/2"-wide bloom, 24" in height with good stem strength.